Do People Still Get Leprosy? Home > Dangerous Bacteria > Do People Still Get Leprosy? Yes, there are at least 250 000 people who have leprosy in the world today. There have been great efforts over the last few years to reduce the impact of this disease, but there are still nearly 120 countries in which leprosy causes illness. Surprisingly, these include the USA, which sees about 150 new cases each year, the UK and many countries in Europe. These are generally in people migrating from leprosy-endemic areas who settle elsewhere in the world to live, work or study. The UK, for example, has a growing Brazilian community and Brazil has a high number of leprosy cases, so leprosy has been seen very recently by British doctors. Leprosy has been known as a disease since ancient times, probably as far back as 1500 BC. Historically, people with leprosy were treated with great suspicion and usually forced to leave their homes and settlements and live away from everyone else in 'leper colonies'. People were also made to wear special clothing to let others know they had leprosy, to walk away from others, and to ring bells to advertise their presence. The disease has affected millions of people during history and for most of that time, it was regarded as either hereditary or as a curse from God or the gods, depending on which religion people adhered to. In 1873 Gerhard Henrik Armauer Hansen identified the bacterium Mycobacterium leprae as the infectious cause of leprosy. This mycobacterium is closely related to Mycobacterium tuberculosis, which causes TB. Because of its discoverer, leprosy is also sometimes called Hansen's disease. 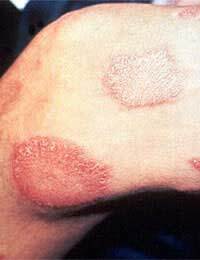 Leprosy begins with infection by Mycobacterium leprae in the skin, which causes swellings or nodules to form. As the infection progresses, it damages the nerves in the fingers, hands, toes and face, or other parts of the body, around where the nodules have formed. This causes a loss of sensation in the affected areas of skin, which leads to people with leprosy damaging themselves accidentally, causing wounds and trauma to the affected areas. This creates opportunities for further infections by other bacteria, and is the cause of much of the disfigurement that is associated with leprosy. Since the 1980s, a very effective treatment for leprosy has been available and has been used in all countries that have active leprosy since the mid-1990s. Multi Drug Therapy (MDT) consists of treatment with three antibiotics at the same time. Rifampicin, Clofazimine and Dapsone are given daily for a period of between 6 and 12 months. This stops the infection but cannot reverse any nerve damage, which is untreatable, so it is important for people to be put on therapy as soon as possible. Mycobacterium leprae is a very slow-growing organism and it takes a couple of years to start have any obvious effects. This is good in one way, because it allows treatment to be started before any real nerve damage results. However, in the earliest stages, although there are no signs of the infection, the infected person is still able to transmit the disease to others, so it is difficult to stop leprosy passing from person to person. A new development that could be used throughout the world from about 2010 is the use of antibiotics as a prevention. The idea is to treat the person with obvious leprosy as soon as possible, but then to also provide a short course of antibiotics for all the people they come into close contact with. Their family, relatives and friends. This could be very effective in cutting the transmission of leprosy, and cases could decrease. Is There a Leprosy Vaccine? Not a modern vaccine, but the BCG vaccine that has been used in the past against tuberculosis is quite effective at preventing leprosy. Its use is declining in most areas of the world, however, because it is not too effective at preventing TB. Mycobacterium leprae is being studied to see if new vaccine candidates can be found, but none have yet reached the stage of clinical trials. Is Leprosy Still Seen as a Curse? Yes, in many cultures there is still a lot of stigma associated with leprosy. This generally discourages people from seeking treatment as soon as they notice signs of the disease. More education and information is being put out in countries that have much leprosy, or where leprosy is increasing with the hope that this will happen less in the future.